ACEH (full name: Naggroe Aceh Darussalam, meaning “the Abode of Peace”) is one of the three “special territories” among the 27 administrative provinces of indonesia. Its location, on the large island of SUMATRA in the northeast corner of the Indonesian archipelago, facing the Andaman Sea and the Straits of Melaka, makes it the closest Indonesian departure point to Mecca, from which it gets the label “veranda of Mecca.” The label is also appropriate on account of the evidence that the Acehnese have the longest history of conversion to Islam in Southeast Asia, dating back to the 9th century, and today as a group represent one of the most staunch adherents of the faith in the region. Aceh was able to survive as an independent Muslim kingdom since its inception in the early 16th century up to the late 19th century, when it became entangled in a power struggle between British and Dutch colonial interests. Through an Anglo-Dutch treaty in 1824, the British transferred control of some of its possessions to the Dutch, who agreed to allow the independence of Aceh. In 1871, against the neutral positions taken by the Americans and Europeans, the British allowed the Dutch to invade Aceh, possibly to avert French encroachment in the region, but they were never able to pacify Acehnese resistance, which lasted until World War II. In 1949, the Dutch handed their possessions in the Malay Archipelago to Indonesia, without ever consulting Aceh. The newly independent Indonesian government immediately dispatched troops to annex Aceh, resulting in widespread resentment of what was viewed as foreign occupation. In 1959, as a way of appeasing the Acehnese, Indonesia conferred on Aceh the status of a “special territory,” allowing a degree of autonomy in matters affecting religion, education, and provincial administration. While this move placated those in favor of a union with the rest of Indonesia, the pro-independent movement remained and subsequently went underground under the name Gerakan Aceh Merdeka (GAM), or Aceh Independence Movement. 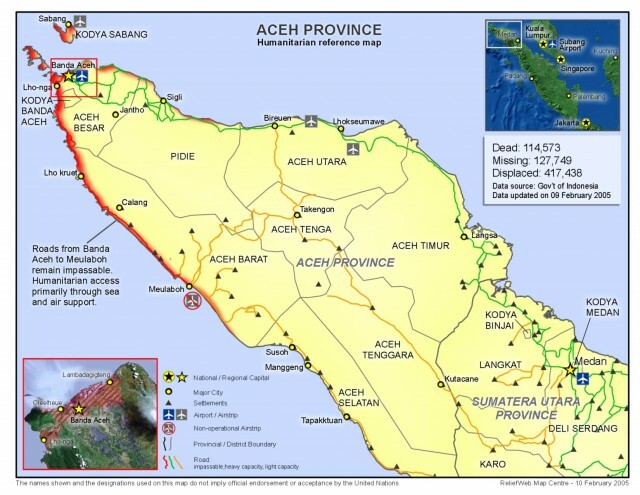 In the face of secessionist movements in two other provinces (east timor and Papua), the central government declared Aceh as a Military Operations District (Daerah Operasi Militer) in 1989, in a large-scale effort to eliminate GAM. After a decade of oppressive campaigns resulting in nearly 3,000 casualties and the destruction of homes and sources of livelihood, military operations were withdrawn partly in response to worldwide protest and criticism against the Indonesian government. As of late 2004, the outcome of the Acehnese struggle for independence remains to be seen. The options being deliberated in the media include: continue to fight for outright independence; hold a referendum to allow for popular choice whether to secede or not; or engage in a dialogue with the central government under United Nations auspices to uphold the agreements ratified in the “special territory” status. The most contentious issue concerns the right of the province to enjoy its resources (petroleum and timber). This “Abode of Peace” was struck by a series of tsunamis, or tidal waves, on December 26, 2004, resulting in more than 100,000 deaths in Aceh and nearby areas of Indonesia. The tsunamis were created by a massive earthquake, registering 9.0 on the Richter scale, in the Indian Ocean. Into 2005, Aceh struggled not only with the issues of independence but also with rebuilding its flood-ravaged territory and economy.